A reproduction of the Image of Our Lady of Guadalupe, a 482-year-old religious treasure from Mexico will arrive on September 8 at St. Elizabeth Catholic Church until September 17, and will travel to Our Lady of Mt. Carmel Parish September 13-16. The Missionary Image from the Guadalupe shrine in Mexico City is a gift of the Catholic Bishops of Mexico to the people of the United States and is visiting a number of cities across the country, as well as in the Kenosha area. It is a digital replica of the Virgin on the “tilma,” or cloak of Aztec Indian Juan Diego, who on December 9,1531 reported that she had appeared to him on the barren hill at Tepayac, Mexico, asking that a church be built there to show her merciful love to all of her children. The cautious Bishop asked Juan to ask the Lady for a sign. Juan did so, and on December 12, Mary appeared again to Juan on Tepayac Hill and told him to pick the Castilian roses (from his native Spain), which miraculously appeared there and to bring them to the Bishop as a sign for him to believe the request. He gathered the roses into his tilma and brought them to the Bishop. It is believed that after he presented the roses to the bishop, the pregnant Image of Our Lady of Guadalupe appeared on the tilma, where it remains to this day. Catholics who honor Our Lady of Guadalupe believe her purpose then was to bring peace between the Aztecs and their Spanish rules and credit her with the conversion of 9 million Aztecs in the following years. 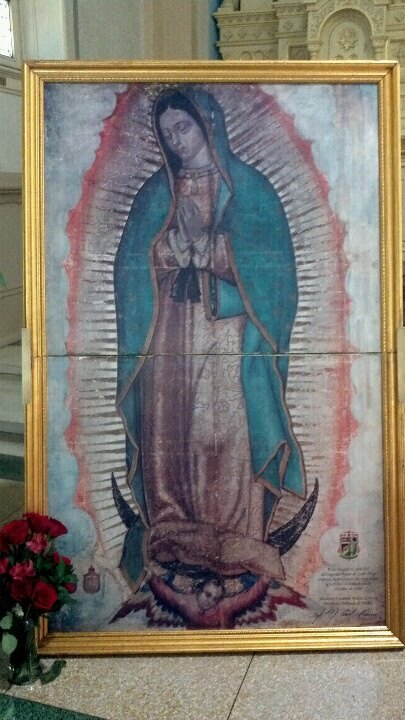 Our Lady of Guadalupe is a dark young mestizo woman with rich robes of indigenous design and color. Her hands are folded in prayer and she is surrounded by heavenly rays. According to Fr. Sean Granger, pastor of St. Elizabeth Catholic Church, tests have shown that this image is not a painting and the tilma shows no sign of decay after so many years. That St. Elizabeth parish was picked to host the Missionary Image on the birthday of Mary is another coincidence, as well as the fact, that St. Elizabeth was Mary’s cousin and the mother of John the Baptist. According to Beverly Beyers, who attends the parish, the opportunity to meet Dan Lynch, the National Guardian of the Image, happened in 2010 at a Marian Conference in Chicago. She was there to sell her scripture art and had the opportunity to speak with Lynch about the Image. While there have been miracles associated with the presence of the Image, Granger cautions individuals to come not expecting a miracle, but because Mary directs people to Jesus and it is an opportunity to get to know Mary more. Sept. 12 Open 8 am -8pm. Sept. 17 8 am – 12 noon. This entry was posted in Kenosha News. Bookmark the permalink.